The elastic agent profile apart from having docker container configurations, provides an ability to configure an EC2 Instance. This would be useful in cases where a docker container cannot be created on the EC2 Instance provisioned using configurations provided in the plugin settings. Profile ID: Specify a unique id for this profile. 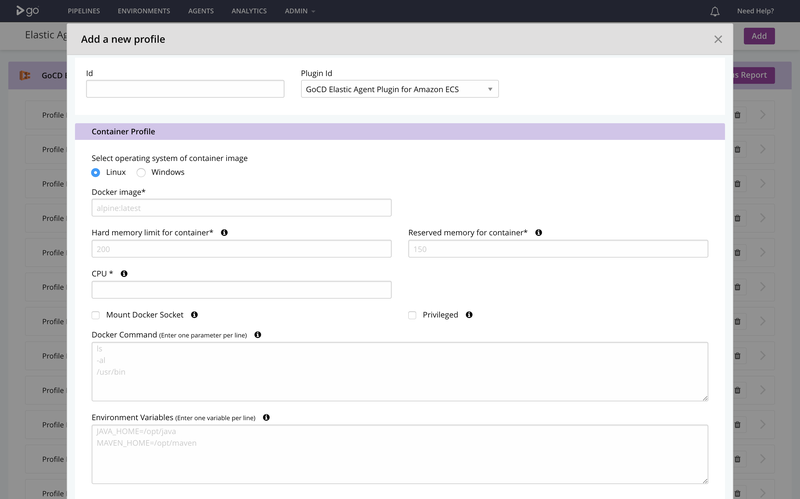 Plugin ID: Select GoCD Elastic Agent Plugin for Amazon ECS from the dropdown. Reserved memory for container*: The docker container will start with this amount of memory. This option is only available for Linux platform. This field takes a positive integer, followed by a suffix of B, K, M, G and T to indicate bytes, kilobytes, megabytes, gigabytes or terabytes respectively. Read more about memory. CPU*: The number of cpu units to reserve for the container. A EC2 instance has 1,024 cpu units for every CPU core. This parameter specifies the minimum amount of CPU to reserve for a container. Read more about CPU. Linux: If set to 0, container will only use unallocated CPU units. Unallocated CPU units are split equally between all containers. Windows: We recommend using at least 1024 CPU units (1 core) for Windows. Allocating lesser CPU units(including 0) will result in very slow running container. Privileged: When this parameter is true, the container is given elevated privileges on the host container instance. This is useful to run docker in docker workflow. Docker Command: Specify the command to run in the container. Enter one parameter per line. This allows you to override the CMD that is specified in the Dockerfile, or provide one in case the Dockerfile does not contain a CMD. Read more about CMD. Environment Variables: Specify the environment variables. Enter one variable per line. This allows you to override the ENV that is specified in the Dockerfile, or provide new environment variables in case the Dockerfile does not contain any ENV. Read more about ENV. Elastic Profile: This will override the variable value specified in plugin settings and Dockerfile. Plugin Settings: This will override the variable value specified in Dockerfile. Dockerfile: Variable defined in Dockerfile has low precedence over other two. For example, variable Foo defined in plugin settings or elastic profile will override the variable defined in Dockerfile. Specify the configuration for the EC2 instance. This is optional. If specified, then the docker container(s) will be spawned on the EC2 instance matching specified configuration. Otherwise, it will be spawned on EC2 instance created using the global configuration specified in Plugin Settings.